This is where the park gets it's name from; in the 1760s a tribe of Illiniwek indians were trapped on the rock by a band of Potawatomi to avenge the death of Chief Pontiac of the Ottawa. In stead of surrendering, they stayed on the rock and starved to death. It's never been determined wether the story is true or not, and it is now considered to be rather legend then truth. As early as 1682, the rock was used by French explorers who built a fort called "Fort St. Louis" on top of it. 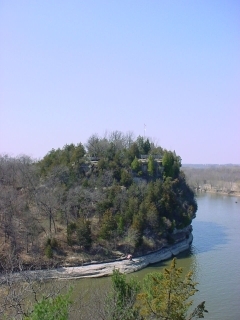 From the rock, overlooking the Illinois River, you have a great view of the park and surrounding areas.